South Africa is the first country in the world to approve Regulations and Technical Standards for Commercial Drone Pilots now officially known as Remote Pilot Aircraft Systems (RPAS). This approval makes South Africa, a member of ICAO (International Civil Aviation Organisation), the first Country in the World to approve an RTO (Remote Training Organisation) for Commercial Drone Pilots. ProWings Training is the FIRST SACAA accredited RTO in South Africa and currently has two RPL Instructors. They are Ian Melamed and Michael Muller. 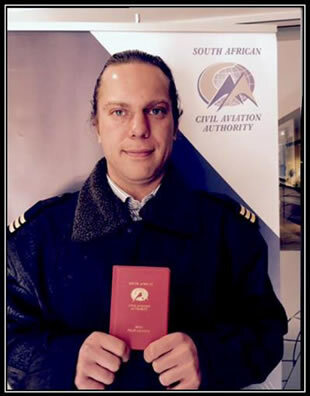 Ian Melamed is also the FIRST SACAA Designated Flight Examiner (DFE) for Remote Pilot Licences in South Africa. 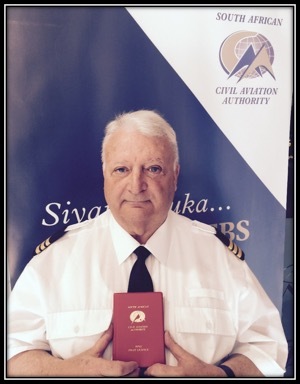 On receiving his RPL Licence, Melamed said "if you consider that the Regulations on RPAS (Remote Piloted Aircraft Systems) came in effect on the 1st July, then SACAA have achieved miracles in processing RPL Licence Holders and Instructors in such a short time". Melamed added "it is a myth that it would take 6 months for Drone Pilots to train for their RPL Licence and cost R150 000. A special 10 day Course has been organised for experienced Drone Pilots in both Cape Town and Johannesburg starting on 3rd August and will cost less than 15% of the mythical R150 000. "Melamed said "Drone Pilots have become an essential part of the Film Industry. When the new Regulations were announced, there was extreme unhappiness. The commercial use of Drones has mushroomed in South Africa. Licenced Drone Pilots will soon return to help in the fight against Rhino Poachers. "Melamed added "it was only a matter of time before the Civil Aviation Authority would have to introduce Regulations to protect the safety of all Aviation Users. The challenge is to incorporate Drone Pilots into Aviation Space as quickly as possible and welcome them as fellow Aviators." Former Africa INTERPOL Representative specialising in Computer Crime and Terrorism and Mentor to SAPS Commercial Branch. Ian headed the Drone Anti-Rhino Poaching Team at Hluhluwe iMfolozi Game Reserve. He is the CEO of ProWings Training. The Chief Flight Instructor of ProWings Training, Michael Muller said, "Our Team is extremely proud for being approved the first Commercial Drone Training Organisation." I’m so inspired by by Mr Ian Melamed. He’s an icon and we should learn from him especially people who want to do a remote pilot license and a drone pilot licence as me. I believe everything can be done in a sober mind.